Fibroblasts — cells of youth! After a lot of doubts and thoughts, Federal Service on Surveillance in Healthcare and Social Development of Russian Federation faced the inevitable reality and made an outstanding decision to allow an application of allogenic fibroblasts! Fibroblasts — cells of the middle skin layer (derma). Their mission is to synthesize an enormous amount of biological active factors, components of extracellular matrix and to restore it. Extracellular matrix contains key elements, including growth factors, that control the regeneration of the skin. Fibroblasts also synthesize ferments, that degenerates collagen and hyaluronic acid, and then synthesize these molecules again in their new form. Thus, the extracellular matrix always renews, so our skin gains its healthy and shiny look. constant tense anxiety and so on. The amount of fibroblasts should be restored to the level of inherent with the young tissues, without any harm to intrinsic skin cells. According to data obtained in the Center of cells technologies Beauty Plaza, the most preferable method of young skin cells obtainment – is a delicate skin sample intake from behind the ear, because of the most abundant number of cells there. Then for every patient the personal Bank of inherent skin cells is formed and the process of their cultivation can be started. This process is performed under artificial conditions with the use of high-tech equipment, under the strict control of specialists of Beauty Plaza International cell technology department. The whole process can be seen by a patient on-line. Why are the autologous fibroblasts? These cells synthesize your own proteins, totally compatible with any part of your tissue and don't cause any counteractions with other proteins. placenta -derived – can be added according to patients agreement into the individual treatment program for “peach” color skin obtainment. These “proteins of youth” can be applied to many zones, for example, face, hands, neck, décolleté, abdomen and buttocks. It is worth to be mentioned that there is nothing as effective as fibroblasts to fight with stretches: placenta-derived fibroblasts are the only to improve the reason of the stretch – dishormonosis. A small sample of skin is taken to make a patient his Bank of cells, this sample is taken from the operation room to the laboratory. 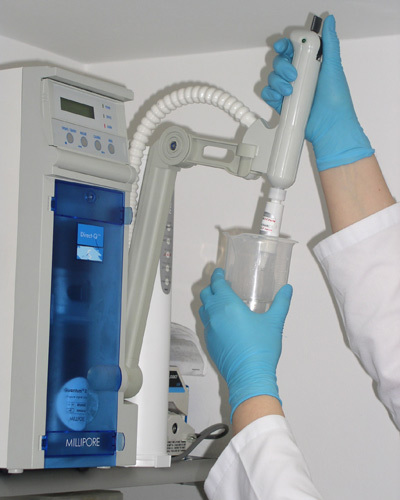 There, under sterile conditions the mechanical and fermentation processing is performed, so the cell suspension is obtained. 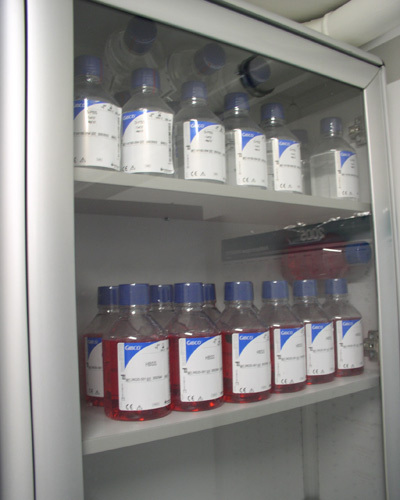 With the help of a special filter and centrifuge series fibroblasts are isolated. The fibroblasts suspension is taken to special culture flasks, were they under special conditions (37°С, 5% СО2) are incubated and cultivated. Cells attach to the plastic surface and begin to divide mitotically, so their number increases up to several hundreds. 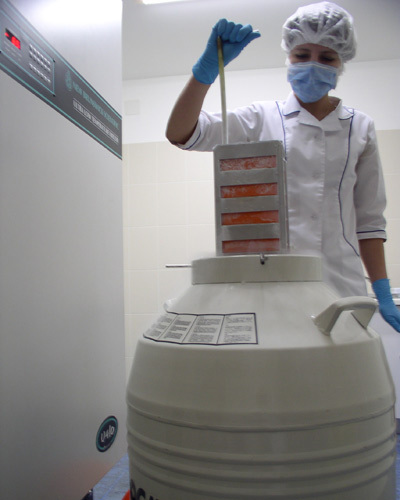 After their cultivation, that is aimed to obtain their sufficient number, a cell procedure is done, but a part of these cells can be cryopreserved for storage in the Bank for future application. The cell transplantation procedure is performed in a day hospital, outpatiently. 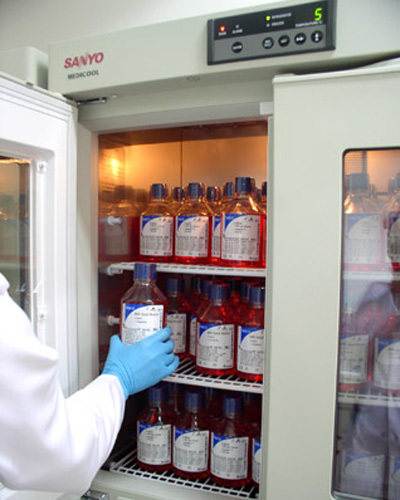 To perform the procedure laboratory staff cultivates and obtain the sufficient number of fibroblasts. 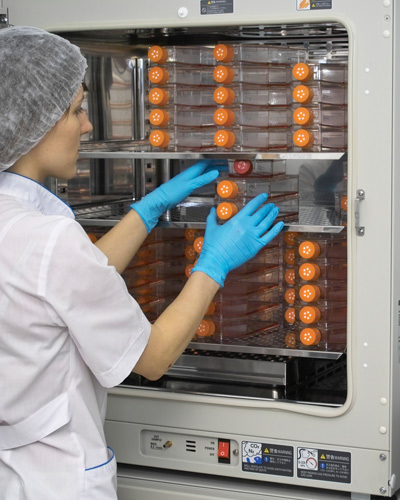 The ready-for-use cell suspension is given to cell transplantation specialists. Cells are injected directly into the derma of a problem area by mesotherapy. In an hour a patient can turn to his normal life. It is not recommended to take antibiotics and other strong antibacterial medicals, alcohol, sauna and sun-rooms attendance, sun bathing during a week after cell transplantation are also unadvisable. Microscopic examination of the skin sample before fibroblasts injections. Microscopic examination of the skin sample in a month after fibroblasts injections, they actively divide and gradually fill up the intracellular space. The skin sample in three months after fibroblasts injections. Young cells filled up almost all intracellular space, they actively produce cell proteins – collagen and elastin. Skin looks more young, dense and resilient, small wrinkles fade away, the lifting effect is evident. 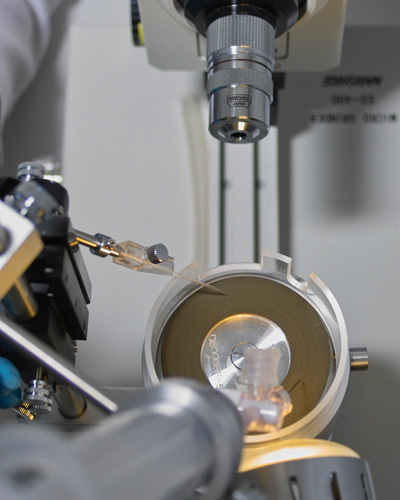 Only present-day high-technology equipment is used to perform the procedures of cells obtainment and transplantation. 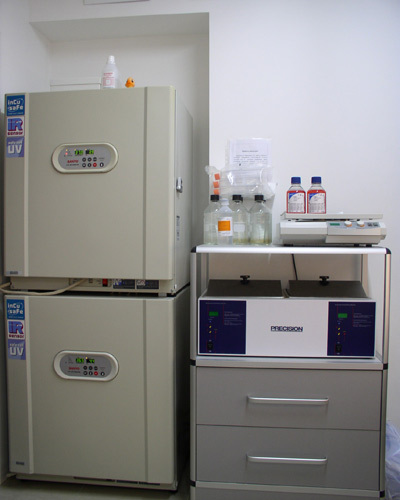 The laboratories are equipped according to GMP standard. 1. Teplyashin A.S., Tchupikova N.I., Sharifullina S.Z., Rostovskaya M.S., Korjikova S.V., Abdrakhmanov I., Dunaev A., Petrin S.A., Eremenko V.S., Savchenkova I.P. 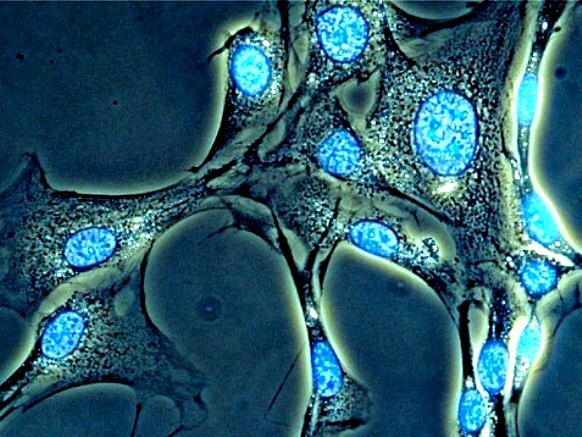 Characterization of human MSC-like cells isolated from bone marrow, adipose tissue, skin and placenta. Proceedings of the Annual fall Meeting German Society for Biochemistry and Molecular Biology, Symposium: ECTS”. Münster, Germany. September 19-22, 2004. p.24. 2. Sharifullina S.Z., Chupikova N.I., Yeremenko V.S., VasyuninaN.Y., Korzhikova S.V., Teplyashin A.S. Isolation, characterization and perspective of clinical application of human MMSC’s after skin burn. Tissue Engineering. 2007. V.13 (7), p.1720, abstract 258. Proceedings of the European Chapter Meeting of Tissue Engineering and Regenerative Medicine International Society. London, UK September 4–7, 2007. 3. Sharifullina S.Z., Teplyashin A.S., Chupikova N.I., Rostovskaya M.S., Vasyunina N.Y., Korjikova S.V., Savtchenkova I.P. Comparative Analysis of Different Culture Systems for The Long-Term Cultivation of Human Epidermal Stem Cells. Tissue Engineering. 2006. V.12 (4), p.1118. Proceedings of the 8th Annual Meeting of TESI. Shanchai, China, October 22-25, 2005. 4. Sharifullina S.Z., Chupikova N.I., Yeremenko V.S., Vasyunina N.Y., Korjikova S.V., Teplyashin A.S. Perspective of clinical application of human MSC-like cells after laser dermabrasion. Eur. Cells Mater. 2007. V.13. Suppl. 2, p.76. Biotechnology Symposium «From basic research to clinical applications using biotechnology and bioengineering». Lausanne, Switzerland, October 19-21, 2006. 5. Sharifullina S.Z., Kulneva E.I., Chupikova N.I., Korjikova S.V., Savchenkova I.P., Teplyashin A.S. Characterization of human epidermal stem cells in terms of isolation method and culture systems. Proceedings of the International symposium (I.A.P. phase VI network HEPRO and Belgian Society for Cell and Developmental Biology (BSCDB) «The Adult Stem / Progenitor Cell niche». Brussels, P.82, abstract 42, 2008. 6. Sharifullina S.Z., Teplyashin A.S., Savtchenkova I.P.. Isolation and characterization of human epidermal stem cells. Proceedings of 7th International Congress of the Cell Transplant Society. Boston, USA. November 17-20, 2004. P.76, abstract 008. 8. Ростовская М.С., Шарифуллина С.З., Чупикова Н.И., Тепляшин А.С. Выделение мезенхимальных стволовых клеток из плаценты человека и их характеристика. Цитология. 2004. т. 46 №.10. C. 937. 9. Шарифуллина С.З., Чупикова Н.И., Ростовская М.С., Тепляшин А.С. Выделение мезенхимальных стволовых клеток из кожи человека и их характеристика. Цитология. 2004. Т.46 (10), с.948.